Tridandi-swami Srimad Bhaktivedanta Swami Maharaja (Srila A.C. Bhaktivedanta Swami Prabhupada), Founder-Acarya of the world famous International Society for Krishna Consciousness, attained the dust of Vraja at the age of 81 on Monday 14th November (corresponding to the 19th day of the month of Damodara, 491 Gaurabda, on the Sukla Caturthi) in the evening at 7:20 pm in his Krsna-Balarama Temple situated in Sridhama Vrndavana, surrounded by his disciples loudly performing sankirtana, while remembering the lotus feet of Sri Sri Guru-Gauranga Gandharvika-Giridhari Jiu. On 15th November at 12:00 noon, the acarya of Sri Caitanya Gaudiya Matha (Sripad Bhakti Dayita Madhava Maharaja) was informed of the news by telephone by the Kolkata branch of ISKCON in Albert Road. Hearing it, he was very much mortified and immediately sent a telegram to Sri Sri Krsna-Balarama Temple in Vrndavana expressing his sincere respects and condolences. That night, Pujyapada Madhava Maharaja, while lecturing on the Srimad Bhagavata, related briefly Sripada Swami Maharaja’s life history and the news of his disappearance to the audience. Also on the next day, on Wednesday evening, while speaking on the Bhagavata, Pujyapada Madhava Maharaja expressed his pain of separation for his godbrother Swami Maharaja and highly praised his worldwide preaching of the message of Sri Caitanya within a very short span of time. 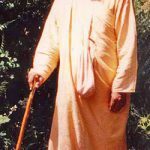 He further revealed the specialty that his foreign disciples have – completely changing their dress code, food, dietary habits and etiquette, and welcoming all Vaisnava behaviour such as accepting a humble dress befitting a Gaudiya Vaisnava, accepting bhagavat-prasada, wearing tulasi beads around the neck, keeping japa-mala in their hands, decorating their limbs with gopi-candana etc, and without any inhibition incessantly performing maha-mantra kirtana, studying devotional scriptures and worshipping the sri vigraha. All this is very happy news. Srimad Swami Maharaja took birth in the English year 1896 in a devotee family in Kolkata. The name of his father from his previous asrama was Gaura Mohan De. His father gave him the name, Abhay Charan De. 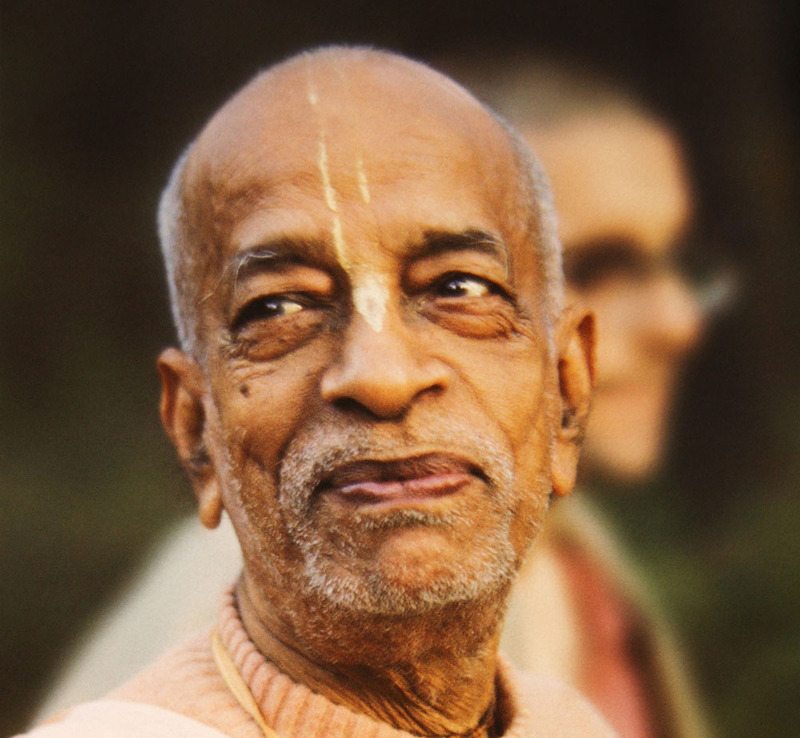 His father was initiated into the Gaudiya Vaisnava dharma. Abhay Charan also received many instructions on devotion to Sri Gaura-Krsna from his revered father. He passed B.A with honours in Philosophy from Scottish Church College in Kolkata. Later in his working life, he took the position of manager in a chemical company (Dr Karttik Basu’s laboratory in Amherst Street). After working there for some time, he started independently manufacturing medicines. 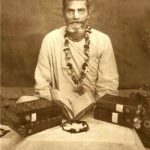 He was married in the year 1918, and in 1933, while in the grhasta asrama, he accepted the shelter of the holy feet of the sun-like acarya of the Gaudiya-Vaisnavas Jagad-guru Nitya-lila-pravista Om Visnupada 108 Sri Srimad Bhaktisiddhanta Sarasvati Gosvami Thakura. His initiated name became Sri Abhaya-caranarvinda Dasa Adhikari. 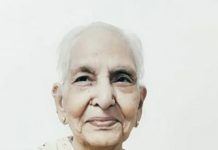 In the year 1959, he took shelter of tridandi sannyasa-vesa from the disciple of the worshippable Sri Srila Sarasvati Gosvami Thakura, the acarya of Sri Gaudiya Vedanta Samiti in Navadvipa, Tridandi Swami Srimad Bhakti Prajnana Kesava Maharaja and came to be known as Tridandi Swami Bhaktivedanta Swami Maharaja. 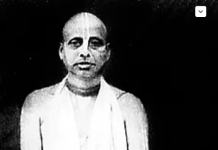 Later, he identified himself as Sri A.C Bhaktivedanta Swami Maharaja. In the year 1944, he published a monthly magazine in English called, Back to Godhead. This magazine is now widely circulated. In various languages millions of copies are sent every month to devotees in various countries. Apart from this, Srimad Swami Maharaja has published many books in English. 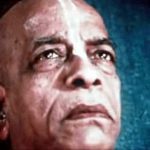 He has written each and every stanza of Sri Caitanya-caritamrta by Srila Krsna Dasa Kaviraja Goswami in Bengali and again transliterated them into English. Then, the way in which he gave the meaning of every word in English and the mastery with which he again translated the entire stanza to English is a matter of special jubilation for any Gaudiya Vaisnava. English speaking devotees very much appreciate this edition as they also have the opportunity to learn the Bengali language while reading that book. The book has been published in several parts. I have heard that its price has been fixed to Rs. 800. 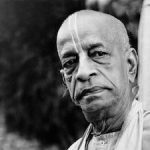 In this way, all of his books written about gaura-lila and krsna-lila have been specially honored by the intelligentsia of the western world. In the year 1956, Srila Swami Maharaja came to Sridhama Vrndavana and eventually stayed at Sri Sri Radha-Damodara Temple in 1959. During this time, he translated the first two cantos of Srimad Bhagavata into English. The translation of books such as the Gita also continued. In the year 1965 at the age of 70, he started for the United States with very little money and means. After one year, he rented a small room in Manhattan in 26 Second Avenue and auspiciously started ISKCON there. At first, he went to New York City via Boston and started preaching the holy name with the accompaniment of mrdanga at Tompkins Square Park. Slowly, good people became attracted to his mission in large numbers. Within just 12 years his preaching spread in all corners of the world. Many educated and wealthy men and women took shelter under him. One by one many preaching centres were established in different parts of the world and the chanting of the holy name reverberated in the sky. After giving the responsibility of managing his spiritual organisation and preaching mission to his disciples, he left for the eternal abode. Sri Gaura’s very own associate Srila Thakura Bhaktivinoda and Sri Srila Prabhupada Bhaktisiddhanta Sarasvati Thakura also had such a special desire and predicted that the message of Sri Caitanya would be preached in England. Srila Swami Maharaja especially endeavored to fulfill their desire in every way. It is a matter of great pride for us that various sevas such as the Deity service of Sri Sri Guru-Gauranga Gandharvika-Giridhari Jiu and festivals like jhulan, Dola-yatra etc, as well as the Ratha-yatra of Sri Sri Jagannatha, Baladeva and Subhadra Jiu are being celebrated in various elite places on continents like Europe and America. Altogether, we are praying at the lotus feet of Bhagavan that the service activities in the organisation established by Srila Swami Maharaja will be managed beautifully with more and more enthusiasm. Srila Swami Maharaja fell ill since the last Dola Purnima, but even still, in that condition, he travelled to foreign countries in order to visit his various temples located there. In the last September month, he went to London. By the desire of Sri Bhagavan he began staying in Sri Vrndavana from October. There he obtained the mercy of Sri Sri Vrndavanesvari. 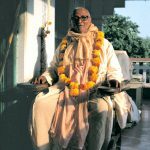 Sripada Krsna Dasa Babaji Mahasaya fortunately arrived at Sri Caitanya Gaudiya Matha in Kolkata on 20th November 1977. He was present in Sri Vrndavana when Srimad Swami Maharaja was leaving his body. 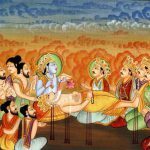 From him we heard that the disciples of Sripada Swami Maharaja were tirelessly chanting hari-nama surrounding his bed on four sides. Although Swami Maharaja had stopped speaking, till the last moment his lips were moving. When Vaisnavas like Sripada Vana Maharaja and Krsna Dasa Babaji Maharaja came to have his darsana, his disciples loudly announced their identity near his ears and he raised his holy hand to his head to show his respect towards them. Even till the last moment of his disappearance his knowledge did not falter. Even after the pastime of his disappearance, his disciples chanted the holy name loudly throughout the whole night. On the Tuesday morning of Sukla-Pancami, he was carried in a decorated palanquin and, accompanied by loud nama-sankirtana, circumambulated the famous seven temples of Vrndavana. Every head Goswami showed him proper respect befitting a Vaisnava acarya by offering him prasada-garlands and sandalwood paste. After that, he was taken to his Krsna-Balarama Temple situated in Ramana-reti and given samadhi as per the standard of sastra.